Last Wednesday, I posted a 2x4 spider craft for Halloween/fall. So, an idea came to mind that every Wednesday until Halloween I am going to post different Halloween or Fall crafts I've done. So by the time Halloween comes there should be 9-10 different crafts. Today, I choose one of my favorites. 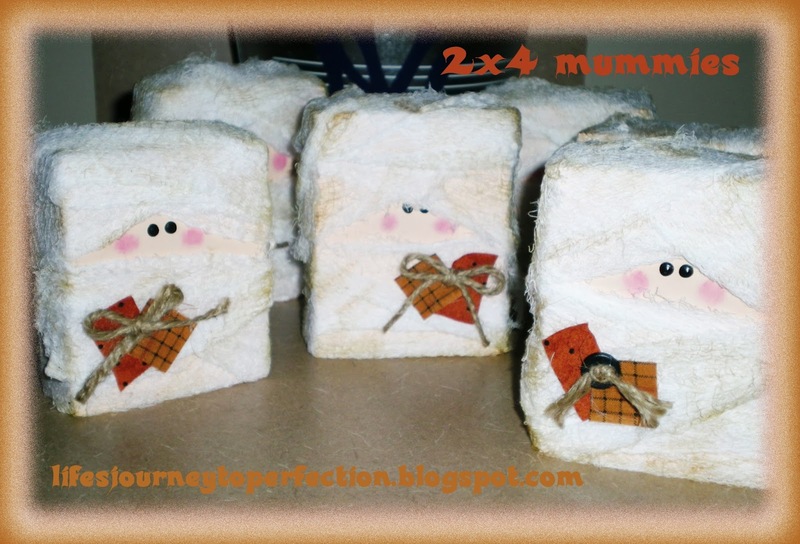 They are these cute little mummies made from 2x4's. 2x4 cut to the length you'd like, I think mine were probably 4- 5 inches long. distressing ink (brown) you could just use brown ink. Cut the 2x4 to the length you desire. Secure a piece of the gauze on the back of the block and then just start wrapping and twisting the gauze around the sides and top and bottom of the block, leaving an opening for the face to be painted on. Finish off by securing the end of the gauze to the back with hot glue. Use the foam makeup sponge to distress the gauze with some brown ink. Using the end of a paint brush, dip it into some black ink and dot the eyes onto the face area. If you could like you could add some smaller dots into the black dots (ends of pins work great for doing this), or you could just leave them all black. With a scruffy looking sponge (you could use an older brush and cut off some of the bristles) pounce it into some white and pink paint. Pounce it onto some newspaper or paper towel until there is not much ink on it. Then you can use it to add the blush to the cheek. Pounce onto the cheek area of the block. Cut your scrap material into rectangles and squares. Glue them on with the glue gun, layering and staggering them on top of each other. Now you can add your button and some jute. Finish off with some clear coat spray. There you have it a super cute mummy decoration. Awww that was so cute! Thanks for sharing this idea for that mummy craft!